Directed by David Yates and written by J.K. Rowling that is based on her fictional guidebook, Fantastic Beasts and Where to Find Them is the story about a British wizard who arrives in New York City where he tries to find three magical creatures who had escaped from his suitcase as he is aided by a demoted Auror, her Legilimens sister, and non-magical baker in retrieving them as he’s been accused of unleashing a mysterious creature wreaking havoc on the city. The film is a prequel of sorts to the Harry Potter universe as it takes place in 1926 New York City as it follows around a young Newt Scamander who would write the guidebook on magical creatures. Starring Eddie Redmayne, Katherine Waterston, Dan Fogler, Alison Sudol, Ezra Miller, Carmen Ejogo, Samantha Morton, Jon Voight, Ron Perlman, and Colin Farrell. Fantastic Beasts and Where to Find Them is an extraordinary film from David Yates. Set in 1926 New York City as the magical community is dealing with anti-wizard sentiment from individuals as well as the threat of Gellert Grindelwald wreaking terror around the world. The film revolves around a young British wizard in Newt Scamander who arrives to the city originally going to Arizona to bring a creature home where he would embark on a series of misadventures in the cities as he would be accused of unleashing a creature that is causing all of the trouble in the city. Among them would involve a non-magical man who would accidentally take Scamander’s luggage causing trouble when three magical creatures are loose forcing Scamander to retrieve them with the non-magical man and two other wizards. J.K. Rowling’s screenplay explore not just the wizarding world in New York City which is very different from Britain but also how they’re having a hard time trying to conceal it to the non-magical community as they’re called No-Majs. There are multiple characters involved in the story that would play into Scamander’s search as well as him being a major suspect of the terror that is looming around the city. One of the antagonists is an anti-wizard activist in Mary Lou Barebone (Samantha Morton) who wants to expose the wizarding world as she turns to a newspaper publisher in Henry Shaw Sr. (Jon Voight) for help as he’s busy making a senate campaign for his son Henry Jr. (Josh Cowdery). Scamander would come across Barebone early in the film though she is unaware of what he really is as the meeting would set off a chain of events when one of his creatures in a niffler would go inside a bank as he would meet the No-Maj Jacob Kowalski (Dan Fogler) who is trying to get a loan to start a bakery. 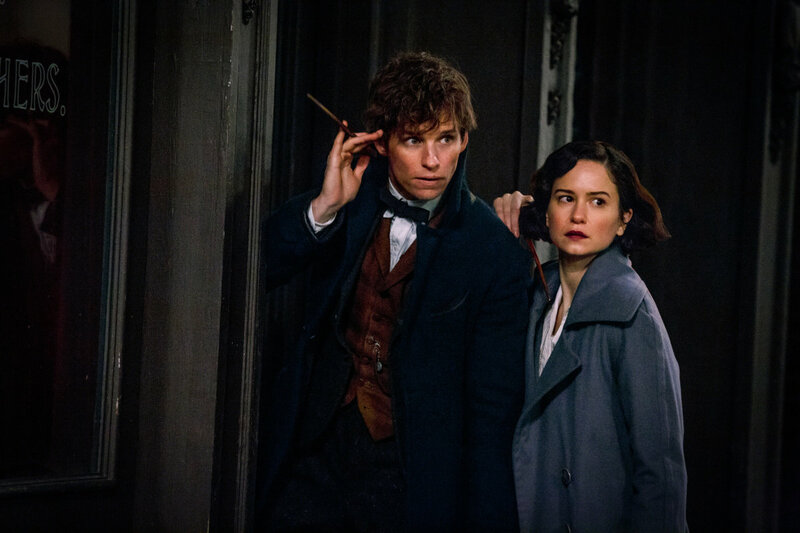 Accidental events happen where Scamander is taken by the demoted Auror Porpentina “Tina” Goldstein (Katherine Waterston) for his actions where they go on a chase to find the three missing creatures with Kowalski and Tina’s younger sister Queenie (Alison Sudol) who is a Legilimens that is very interested in Kowalski. Also involved in the search for the mysterious creature that is wreaking havoc in the city is a magical securities director in Percival Graves (Colin Farrell) who believes that Barebone’s adopted son Credence (Ezra Miller) might know what it is and where to find it in exchange to free him from the abuse of Barebone. Yet, so much is happening as it play into the search for the mysterious creature wreaking havoc in the city while the three creatures that Newt is trying to find prove to be more fascinating as he has a collection of them inside his luggage which he is studying for the book that he would later create. At the same time, he is trying to learn more about his new surrounding as he is also coping with his own issues which Queenie would learn accidentally as it play into his eccentric and awkward persona when he’s around people as he’s more comfortable with magical creatures and animals. David Yates’ direction is definitely dazzling in terms of the world that he creates though the film begins with a montage of the chase for Grindelwald as he’s only seen briefly from the back as it sets the tone for much of the film with the wizarding community in New York City struggling to hide this terror from the non-magical community despite the verbal attacks from Barebone. Shot mainly at the Warner Brothers studio lot in Hertfordshire, England with some of it shot in London and St. George’s Hall in Liverpool as 1926 New York City. The film does play into a world that is filled with intrigue but it’s also quite rich in the way the wizarding community presents itself as house-elves are doing jobs and bartend speakeasies, goblins are the leaders of the financial world, trolls are also citizens, and there’s even a government based in New York City known as the Magical Congress of the United States of America (MACUSA) led by President Seraphina Picquery (Carmen Ejogo). There are also laws that is established such as that magical and non-magical people can’t socialize while magical creatures are banned which makes Scamander’s mission not just difficult but also the need to prove that he’s not the one causing trouble. There are some wide shots in the film to establish the locations yet Yates would use medium shots and close-ups to focus on the characters as they deal with trying to find the lost creatures as well as go after the mysterious creature wreaking havoc on the city. Yates would mix in elements of suspense and humor throughout the film as it would culminate with this grand third act as it play into the reveal of this mysterious creature as well as Scamander’s suspicions towards Graves who has his motives in wanting to find this creature. Especially in his interest towards the troubled Credence which makes Tina uneasy as Credence played a part in her demotion prompting her and Scamander the need to confront Graves. Overall, Yates creates an enchanting and exhilarating film about a British wizard trying to save New York City from a mysterious creature and retrieve three others from harm with the help of two American wizards and a No-Maj baker. Cinematographer Philippe Rousselot does amazing work with the film’s beautiful cinematography as it has a sepia-like tone to the way some of the daytime exterior looks in terms of grey skies and sunny look as well as the usage of lights for some of the scenes at night including the interiors inside Scamander’s home-made zoo inside his luggage. Editor Mark Day does excellent work with the editing for its usage of montages for the opening sequence as well as some jump-cuts for some of the action and other stylish cuts to play into the drama and suspense. Production designer Stuart Craig, with art directors David Allday and Leslie Tomkins plus set decorator Anna Pinnock and associate set designer James Hambidge, does amazing work with the look of 1926 New York City from the home of MACUSA, the apartment that the Goldstein sisters live in, Newt’s zoo inside his luggage, and the dreary home of Barebone. Costume designer Colleen Atwood does fantastic work with the costumes as it play into the period of the mid-1920s with some dresses for the women as well as the clothes that President Picquery wears. Hair/makeup designers Fae Hammond and Marilyn MacDonald do nice work with the look of the hairstyles of the women as well as the haircuts that men had and the makeup for a few of the characters in the film. Visual effect supervisors Tim Burke, Pablo Grillo, Christian Manz, and David Watkins do incredible work with the visual effects from the design of the different creatures that Scamander has collected including his pet plant-like creature in a bowtruckle as well as the look of the city and other magical things. Sound designers Glenn Freemantle and Eilam Hoffman do superb work with the sound from the way some of the creatures sound to the sounds of terror and suspense in some of the darker moments in the film. The film’s music by James Newton Howard is wonderful for its bombastic orchestral score that play into the action and suspense as well as some low-key music for the light-hearted moments while music supervisors Alejandro de la Llosa and Karen Elliott provide a jazz-like soundtrack to some of the original songs played in the film. The casting by Fiona Weir is marvelous as it feature some notable small roles from Dan Hedaya as the voice of house-elf elevator operator, Kevin Guthrie as Tina’s supervisor, Ronan Rafferty as Henry Shaw Sr.’s youngest son Langdon who wants to help Barebone expose the wizarding world, Josh Cowdery as the cruel and arrogant Henry Shaw Jr., Jenn Murray as Barebone’s adopted eldest daughter, Faith-Wood Blagrove as Barebone’s youngest adopted daughter in Modesty whom Credence suspects to have magical powers, and Zoe Kravitz in a small role as the picture of Scamander’s former lover Leta Lestrange. Ron Perlman is terrific as the speakeasy owner Gnarlack as a goblin who was an informant of Tina as it is a charming role in this mixture of visual effects and performance-capture. Jon Voight is superb as Henry Shaw Sr. as a newspaper owner who would come across a major incident as he wants to go after the mysterious creature. Carmen Ejogo is fantastic as President Seraphina Picquery as the leader of MACUSA who is trying to ensure the law and make sure the magical world isn’t exposed as well. Samantha Morton is brilliant as Mary Lou Barebone as an anti-wizard activist who wants to expose the wizarding world as well as destroy wizard and witches while being very abusive towards Credence. Ezra Miller is excellent as Credence as Barebone’s adopted son who is troubled by the beatings he receives from Barebone as he befriends Graves who promises him a chance for freedom in exchange for knowledge of the mysterious creature wreaking havoc. Colin Farrell is amazing as Percival Graves as a magical securities director for MACUSA who is in charge of protecting wizards as he is very powerful while having his own reasons for helping Credence. Alison Sudol is incredible as Queenie Goldstein as Tina’s younger sister who is kind-hearted as well as being an accomplished Legilimens, the ability to read minds, where she knows what to do to help out her sister, Newt, and Jacob whenever they get into trouble. Dan Fogler is marvelous as Jacob Kowalski as a No-Maj cannery worker who aspires to become a baker that finds himself being exposed to the world of magic via accident as he proves to be a helpful ally for Newt and prove his worth to the world of magic. Katherine Waterston is phenomenal as Porpentina “Tina” Goldstein as a demoted Auror who works in a lowly position at MACUSA as a witch trying to do what is right as it was the reason she got demoted while helping Newt retrieve his creatures to realize that he’s not the one that is at fault for the chaos in the city. Finally, there’s Eddie Redmayne in a remarkable performance as Newt Scamander where Redmayne provides this very odd and eccentric collector of magical creatures who arrives to New York City where he unknowingly causes mayhem as Redmayne has this air of charm into his role but also that awkwardness that allows him to be vulnerable when it comes to people as he prefers the company of magical creatures. Fantastic Beasts and Where to Find Them is a sensational film from David Yates and writer J.K. Rowling. Featuring a great ensemble cast, top-notch visual effects, amazing art direction, lovely visuals, and a compelling story about a wizard’s arrival into America. It’s a film that explores the world of magic in a different setting that allow audiences to be enchanted into what the magical world in America is like from the mind who brought Harry Potter into the world. In the end, Fantastic Beats and Where to Find Them is a spectacular film from David Yates. @Brittani-I also had low expectations as I wasn't sure about watching as I've been burned out by Harry Potter for a while. Yet, this was a surprise as it forced me to go back to the book and read about the creatures. I"m up for a sequel. Plus, Eddie Redmayne didn't annoy me in this film which is a plus.